A shopping centre has long ago ceased to be a place where we go merely to do our shopping. Due to the extensive range of entertainment and cultural offer, the shopping centre became an important hub of social life. All these elements are supposed to create an experience extending beyond just shopping and play a key role in shopping centres development strategy. 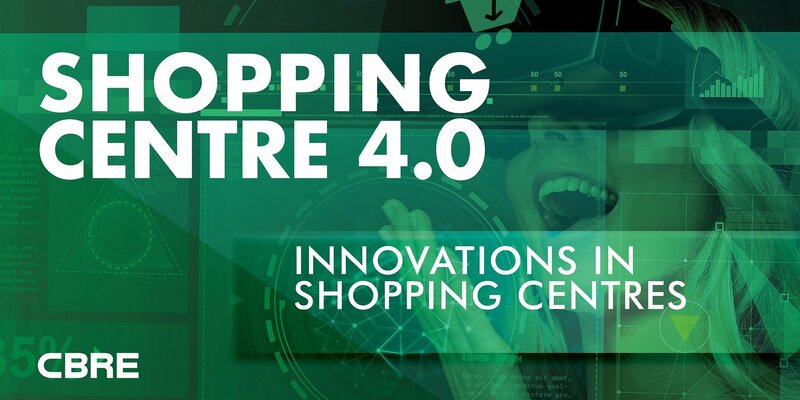 CBRE’s Shopping Centre 4.0 Innovations in Shopping Centres report displays which factors will contribute to dynamic changes on the retail market in the near future. Technological innovations, competition from e-commerce and growing customer needs force shopping centres to introduce changes that will not only meet their clients expectations, but will also enable them to stand out from the competition. Therefore, the shopping centres’ success is now dependent upon an increasing number of factors, which represents a real challenge to both new and already existing schemes. Changes in consumer behaviour as well as the retail market maturity have impact on the evolution of retail schemes. Shopping centres pay great attention to innovation and the expansion of their offer and they thus become an important hub of social life, combining entertainment, culture, education, modern technologies and leisure. This process will intensify over the years and will be influenced by the style and pace of life: consumer needs continue to grow and shopping centres have to adapt in order to meet the challenge. The Polish retail market is aging – according to the Shopping Centre 4.0 report, approximately 50% of buildings are 10 years old or older, which means that there is a need for renovation and modernization of existing schemes in order to give them a chance to compete against the newly delivered investments. Age, however, is not the only factor driving the change in the retail market: we are now witnessing the increasing importance of recreational and leisure infrastructure and food and beverage services – 67% of the Polish population named tenant mix as the second most vital characteristic in the selection of their preferred shopping centre. Growing expectations towards the goods and services offered are the result of Polish society’s lifestyle changes. Polish people are becoming wealthier, more confident, better educated and they understand the importance of leading a healthy lifestyle, which visibly impacts their purchase decisions. According to the data collected by CBRE in 2016, more than half of respondents visited a shopping centre at least once or more than once a week. Along with the growing consumer needs, expectations are also rising towards tenants. In response they introduce more and more innovations to their stores. New store concepts and formats force shopping centres to become more flexible and provide a tailored-made space to meet tenants’ demanding requirements. Mobile offer, pop-up stores and new flagship stores are becoming ever more popular and their goal is to encourage customers to visit a traditional stationary store rather than just do on-line shopping. The increasing share of on-line sales in the total volume of retail sales is creating the challenge to find innovative ways to attract customers to stationary stores. The need to fuse traditional retail with the m-commerce and e-commerce sectors has become one of the most pressing issues for landlords, property managers and tenants. In order to develop competitive advantage, they use innovative technologies that are being quickly and effectively incorporated in the daily functioning of their schemes. Examples of innovative solutions include a mobile app that helps to find the shortest route to the given shopping centre or getting personalized offers based on the customers previous purchase decisions.